There is no doubt that Strava has driven the phenomenon of social cycling, and sociable competition. 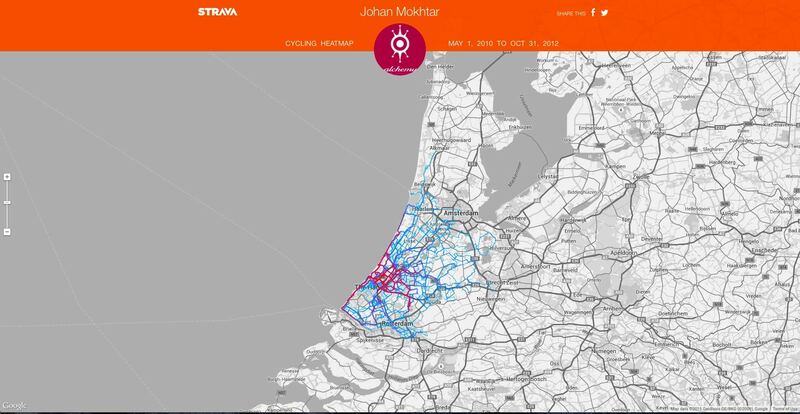 Millions of cyclists track and share their rides on the Strava website. And in doing so, many strive to better their times on each ride, thereby hopefully outdoing their friends on a favorite sector, or even claiming a coveted King of Mountain or Queen of Mountain crown. How many millions exactly? With secrecy typical of a Silicon Valley start-up, Strava does not disclose precisely how many users it has, preferring to say that it has “tens of millions”, with a million joining every 40 days. Wikipedia reports that as of March 2015 there were an estimated 1 million active Strava users. Extrapolating from Strava’s own estimate of the rate at which people join, there are about 126 million active users today. Not bad for a company which was founded in 2009. 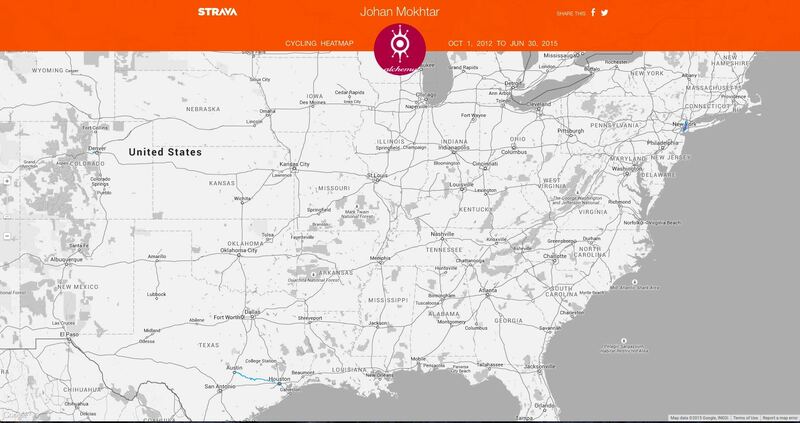 Companies selling cycling-related products have noticed the ever-increasing popularity of Strava, and are using the app to connect with existing and potential customers. One such company is Rapha. In 2010 Rapha launched the #Festive500, an event in which participants challenged themselves to ride 500km / 311mi between Christmas Eve and New Years’s Eve. That year there were 84 participants. In 2011 Rapha started offering woven fabric roundels to everyone who successfully completed the #Festive500 challenge. Strava was an obvious partner because their app made it easy for participants to record their rides and track their progress, and for Rapha to manage the challenge, from sign up to verification that participants had successfully completed the challenge. To say that this partnership is a success is an understatement. The modest number of #Festive500 participants, 84 in 2010, had mushroomed to 83,130 in 2017. There were 19,120 successful finishers for the 2017 Rapha #Festive500. That is a lot of roundels for Rapha to ship out. Each one creating a link between Rapha and a cyclist. In recent years Rapha has capitalised on the increasing popularity of the #Festive500 by offering prizes for the best #Festive500 stories. The 2017 prizes included a Rapha Travel trip and Leica D-Lux camera, a 3T Exploro Team road bike, a Wahoo Bolt GPS Bundle, and a Wahoo Kickr Snap turbo trainer. The winning entries can be seen here. In 2017, the year-on-year growth in #Festive500 participants leveled off. Perhaps because of the very cold winter in the northern hemisphere. That has not deterred the folks at Rapha. They have already asked roadies to make the #Festive500 their end of year challenge for 2018. I wonder what the 2018 roundel will look like? Posted in Gear and Tools and tagged #Festive500, Rapha, Strava. Bookmark the permalink. I enjoy studying graphic representations of data. Like this map illustrating 59,036 routes between 3,209 airports on 531 airlines spanning the globe. And this chart showing our galaxy’s relative size and position within the known universe. The latest graphic to pique my interest is one created by Sisu. Sisu takes your exercise data from Strava or Runkeeper, and turns that data into a print. Sisu has been around since at least 2014. Co-founder Peter Roome posted the first blog entry on the Sisu website in May that year. I found out about Sisu last week, when cycling friends started posting their Sisu prints on Facebook. There are a few designs to choose from on the Sisu website. I like their original design that displays all the routes you covered between your chosen start and finish dates. The plots of each route are sized so all of them fit on one page. Thus the plots are not to scale. Below are the routes I rode in 2010, the year I started cycling. The first four rows show rides within and around Houston, Texas. The rest of the routes are either loops or out-and-back rides starting from Den Haag, The Netherlands. I moved from Houston to Den Haag in May 2010. The rides range from 14.5km / 9mi (row two, far right, which was a short run from my Houston home to Hermann Park and back), to 124.5km / 77mi (row six, third from the left, which was from my Den Haag home to Kinderdijk and back). Even with only fifty rides in 2010, patterns emerge from the plots. Most of my Houston rides were with the West End 6:30 group. We rode a consistent route through the city every Tuesday and Thursday. Most of those are shown on row three. Den Haag is just a couple of kilometers from the coast. You can’t ride very far west before you run into the North Sea. So a lot of my rides in The Netherlands followed the coastline, either south-west or north- east from Den Haag. As you lengthen the timeline, the Sisu plots of each route get smaller. To ensure that, in this case, 885 routes fit on one page. This print shows my entire Strava ride history. I think this print is a fascinating way to review my cycling history. It is obvious from the graphic that my Kuala Lumpur friends and I spent an awful lot of time on the KESAS Highway in 2013 and 2014, as shown by all the horizontal, slightly squiggly routes in the middle third of the print. There was a time when the Bukit Damansara route was popular. This route appears a dozen times in the centre rows. An evening’s ride around the Sepang International Circuit produced this plot . It is not too difficult to find, about two-thirds of the way down the print. More difficult to pick out is this route, my longest ever ride at 445km / 276.5mi . It is in the fourth row from the bottom. Of course, what my Facebook friends and I should be doing is paying Sisu for a print. Prints come on 300 grams per square meter Matt Photorag stock. 300gsm paper stock is at the higher end of paper thickness. The print size is 12 inches by 16 inches for US orders, and A3 size (297mm by 420mm) for orders from the rest of the world. The price for a physical print, or a digital download, are above. I’m thinking of a present to myself when I hit 60,112km / 37,351mi. That is 1.5 times around the circumference of the Earth. Which should be in two months or so. Posted in Gear and Tools and tagged Bukit Damansara, Den Haag, Houston, KESAS, Kuala Lumpur, Runkeeper, Sepang International Circuit, Sisu, Strava. Bookmark the permalink. Cycling GPS units, also called cyclocomputers, from manufacturers like Garmin, CatEye, Lezyzne, Sigma Sport, Wahoo Fitness, Polar, Magellan and others have become ubiquitous. Almost every road cyclist I see has a GPS unit on their handlebar, or on their wrist. Those that do not often rely instead on a GPS app from the likes of Strava, Cyclemeter, Ride With GPS, Map My Ride, or Endomondo, running on a mobile phone. Not many of us use our cyclocomputers or mobile phones to navigate whilst riding, although units with mapping capability are invaluable when you get lost. Instead we use these devices to keep a record of where we have been, when, and how fast we rode. As soon as we can after a ride, we download the ride data from our cyclocomputers to a website like Strava, Garmin Connect, or Ride With GPS. Those using mobile phone apps or a wireless capable cyclocomputer just wait for their devices to do the uploads automatically. Strava is very popular ride tracking site. Cyclists log into to Strava to look at ride statistics. What was our average speed? How much climbing did we do? Did we set any PRs? Did we bag any KOMs? Shown together with the ride statistics is a map overlaid with the route we just rode. An exciting newcomer to the ride visualization scene is Relive.cc. Rather than just displaying a static map of your ride, Relive.cc takes the ride data from your Strava account and creates a movie of your ride. This is the Relive movie of my ride last weekend. Much more interesting to look at than the Strava map above. If I had attached geotagged photographs to my Strava ride record, those photographs will have displayed at the appropriate spots in the movie. Now that I have linked my Strava account to Relive.cc, I get movies of my rides within an hour of uploading my ride data. Posted in Gear and Tools and tagged Garmin Connect, GPS, Relive.cc, Ride With GPS, Strava. Bookmark the permalink. I’m not as fanatical about Strava as those who subscribe to these quotes may be. Close though. All my rides are saved on Strava. Most of my riding buddies use Strava too. There is something quite satisfying about reviewing ride metrics on Strava. Not to mention completing challenges and winning trophies. Even if those trophies are just icons on your profile. And I am a Premium Member. Which unlocks additional goodies like the Suffer Score, and Filtered Leaderboards. I’ve recently discovered more Strava goodies. Courtesy of Strava Labs. The millions of activities uploaded to Strava have created a dataset of nearly a trillion GPS data points. 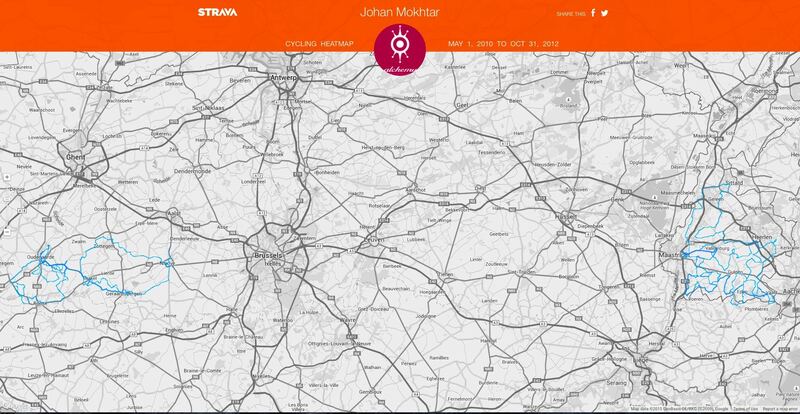 Strava Labs showcases interesting projects that use this dataset. Projects like The Roster, which visually analyses your athletic social habits, total group activities and your preferred training partners. 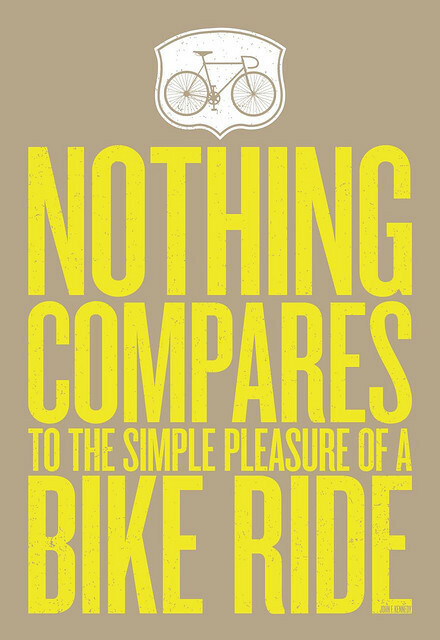 In my case, ranging from someone I have ridden with 111 times, to the person I rode together with only once. The data points for Malaysia produce this heatmap. The global heatmap is zoomable. This is the center of Kuala Lumpur at maximum zoom. Then there is The Clusterer. This project creates a map that is searchable by distance and activity type. This map shows the four most popular ride routes around Kuala Lumpur. Clockwise from top right are Genting Sempah to Janda Baik, Hulu Langat, KESAS and Guthrie Corridor to LATAR. The small loop in the center is the OCBC Cycle Malaysia 2014 route, which was saved to Strava by 190 people. The KESAS Night Ride, by contrast, clusters 1,830 rides. There are more projects listed on the Strava Labs homepage. There is also a link to a blog where you can read about Strava’s technology, culture and latest projects. And if you fancy developing your own project, the Developers link takes you to a comprehensive portal for information about the Strava API. Enough to keep a Strava geek occupied for days. Posted in Gear and Tools and tagged Heatmap, Strava, Strava Labs. Bookmark the permalink. June has been a quiet month for riding. The weather, weekend travel, illness and idleness have all kept me off my bikes. 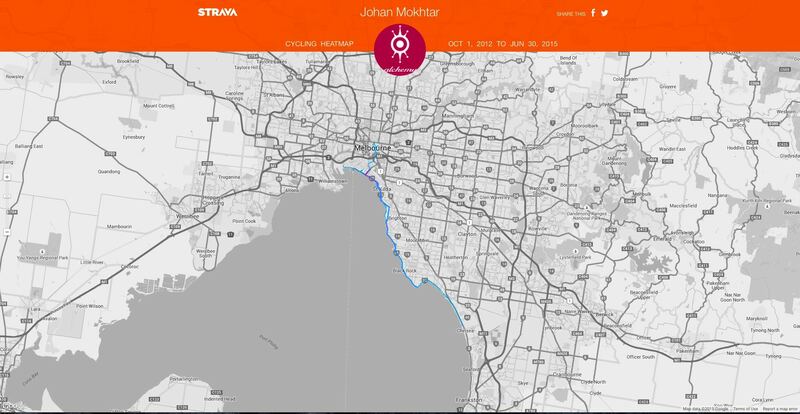 I started 2015 with aspirations to average 1,000km a month. So far I am 150km per month short of that goal. Nevertheless 2015 is shaping up to be one of my better years for cycling. I consider my first day as an avid cyclist to be Sunday January 31st, 2010. That was the day Big Bill B guided me on a 53km loop around Houston, including a food stop at Carter & Cooley Company Delicatessen in The Heights. It was the first time I rode with a Garmin cycling computer on my handlebar, which allowed me to commit this and all future rides to that collective memory that is the internet. I am a bit of a ride data geek. I started feeding that habit with Garmin Connect. After a few years I supplemented that with Ride With GPS, and very soon after Strava was added to the mix. Lately Veloviewer has joined the party. Why so many tracking apps? In my case, mostly because they each provide different ways to view my ride data. Ride With GPS provides nice summaries by month or year. I can see what my buddies have been up to in Strava. Veloviewer makes annual comparisons easy. 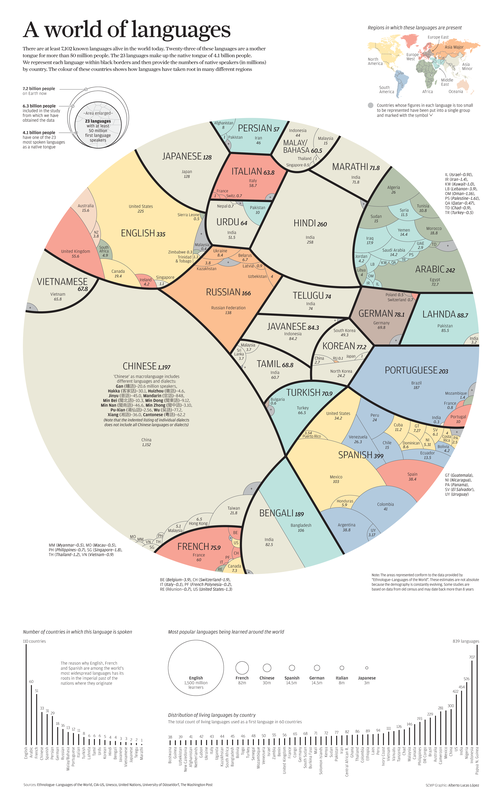 Charts like these ones provide the grist for this post. Between January and the end of April 2010 I rode in and around Houston. Those rides included my first century ride, The Space Race, and my first BP MS150. My biker chick had started her new job in Den Haag, The Netherlands, in April. So my bike spent May in a container, along with our other possessions, on a ship bound for Europe. I spent the rest of the year exploring the bike paths around Den Haag. I logged 2,831kms in 2010. My average ride distance was 59kms. My average ride time was 2 hours 28 minutes. In 2011 my total distance covered jumped to 6,886kms. My average distance went up slightly to 63kms. The average ride length went up in tandem to 2 hours 33 minutes. Much of that increase in total distance ridden is testament to the outstanding cycling infrastructure in The Netherlands. You can’t help but get on your bicycle in a country where the riding in so safe, convenient, and scenic. In 2012 my mileage again jumped significantly over the previous year. To 11,019kms. The average distance stayed almost the same at 62.25kms. I picked up speed though, with my rides averaging 2 hours 29 minutes. Almost all of my riding over these two years was in The Netherlands. I did occasionally venture further afield. I made my first extended cycling trip in 2011. I went to Ninove in Belgium, to ride in the Ronde van Vlaanderen sportif. In 2012 I did the Ronde van Vlaanderen again, which started and ended this time in Oudernaarde. I also took two trips to Maastricht, for the UCI World Championships and the Amstel Gold sportifs. In October 2012 my biker chick and I returned to Kuala Lumpur. My bikes (by this time I had two) followed soon after by air freight. So it wasn’t long before I was immersing myself in the relatively new and booming road cycling scene in Malaysia. Cycling in Kuala Lumpur reminds me a lot of cycling in Houston. You share the roads with traffic. Sometimes a lot of traffic. City riding is best done at night, when the roads, or motorcycle lanes where provided, are quieter. The popular daytime cycling routes are mostly outside the city. In 2013 I started venturing further afield. Century rides in various cities around the country become a regular activity, including one international road trip to Hatyai in Thailand. Despite the number of century rides, my mileage in 2013 was only 7,102kms. My rides had become shorter, averaging 49kms and 1 hour 58 minutes per ride. I remember that tropical rainstorms had a lot to do with curtailing riding time in 2013. The downward trend continued in 2014. I had four months of enforced time off my bikes because of a crash, and two unrelated surgeries. Those breaks from cycling resulted in only 3,918kms ridden. My average ride was surprisingly long though, at 66kms and 2 hours 35 minutes. 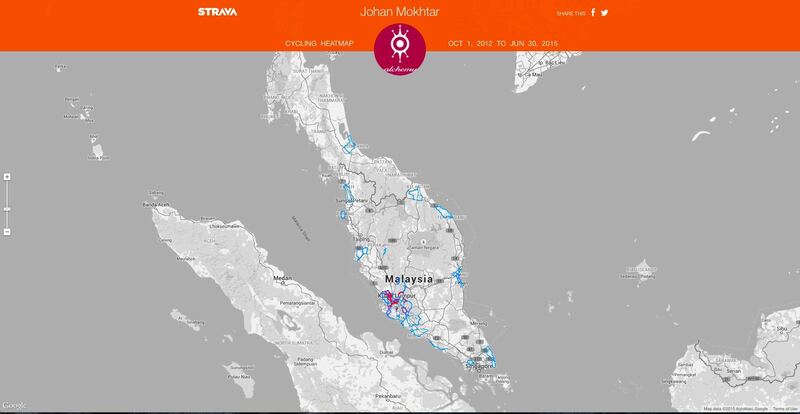 Almost all of my cycling since the end of 2012 has been in Malaysia. The exceptions were in 2013, when I flew to the United States to ride in the BP MS150 from Houston to Austin, and to ride in the 5 Boros Ride in New York City. In between those rides I visited an old friend in Denver, where I managed to squeeze in a few rides as well. I came home with bicycle number three. That bicycle is a Ritchey Breakaway. It came with me to Melbourne in December 2013. My last cycling trip away from home to date. 2015 looks good so far. I am up to 5,078kms as at the end of June. My average ride length for the year is 71kms. I must be a bit fitter than I was last year too. I am riding on average 5kms further this year as compared to last, but my average time is the saddle is only 3 minutes more, at 2 hours 38 minutes. I’m hoping to take at least one cycling trip outside Malaysia this year. And I am looking forward to staying healthy and spending as much time as possible riding. 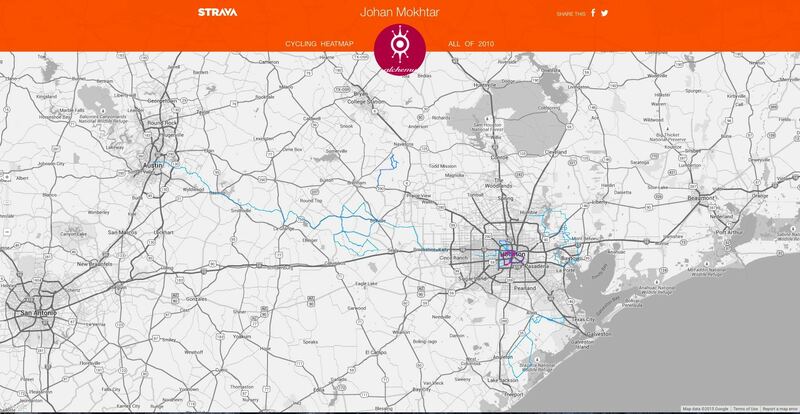 Posted in Cycling in Belgium, Cycling in Colorado, Cycling in Malaysia, Cycling in New York, Cycling in Texas, Cycling in the Netherlands and tagged Garmin Connect, Ride With GPS, Strava, Veloviewer. Bookmark the permalink. Regular readers know that I am a fan of gadgets. If it is a cycling gadget, I am truly hooked. I read some reviews of the LifeBEAM helmet. The technology intrigued me. Optical sensors read pulse signals directly from the forehead, and state of the art algorithms then remove ‘motion-generated noise’, process all the data in real time and send accurate heart rate numbers to a mobile device. The prospect of no longer having a heart rate monitor strapped to my chest appealed to me. The fact that this technology was initially developed by LifeBEAM to monitor the vital signs of pilots and astronauts only added to it’s appeal. I logged on to the LifeBeam site, invoked that financial facilitator known as Paypal, and ordered a helmet. The helmet arrived with a few extras. A cloth carrying bag, and this carry on carbon case. Most unusual for a cycling helmet was of course the micro USB charging cable. 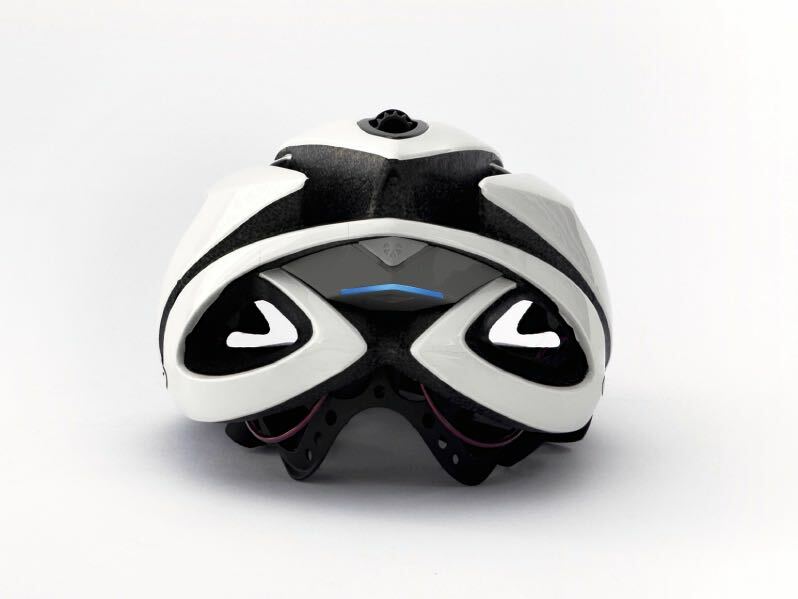 The optical sensor and electronics module are built into a Lazer Genesis helmet. From the side the helmet looks like any other unmodified Lazer Genesis, apart from the discreet LifeBEAM logo. The view from the rear reveals the dark grey electronics module, including a triangular light-grey flap that covers the micro USB charging port, and the blue status light. Barely visible below the status light is the power button. 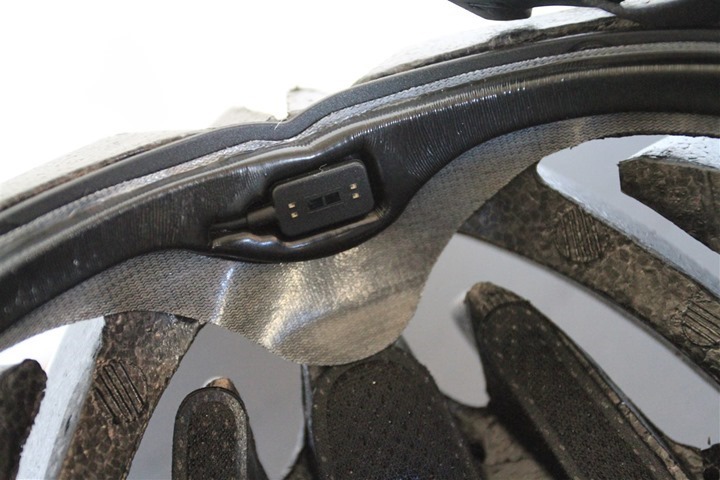 The optical sensor is inside the front edge of the helmet, surrounded by a gel pad. The optical sensor must be resting against the skin of your forehead, not too tight or too loose. If you wear a helmet liner or a skull cap, it must not obstruct with the sensor. You will have to find the sweet spot where the helmet fits comfortably and the heart rate is being displayed. The helmet comes with both ANT+ and Bluetooth 4.0 connectivity. So it will pair with all Garmin devices, as well as Suunto, Timex, and other ANT+ enabled watches. On the Bluetooth side the helmet will pair with mobile phones, and is therefore usable with the slew of iOS and Android cycling, running and general fitness apps. Initial setup was simple. Charge the battery, turn on the electronics, and pair the helmet with your device of choice. 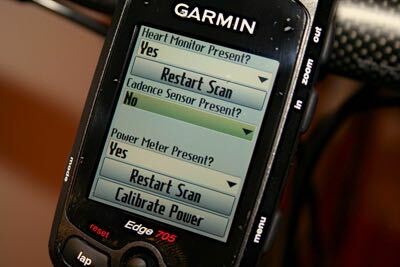 On my Garmin Edge 705 I went into the Settings > ANT+Sport > Accessories menu and selected Restart Scan. The Edge 705 picked up the transmission from the helmet in seconds. 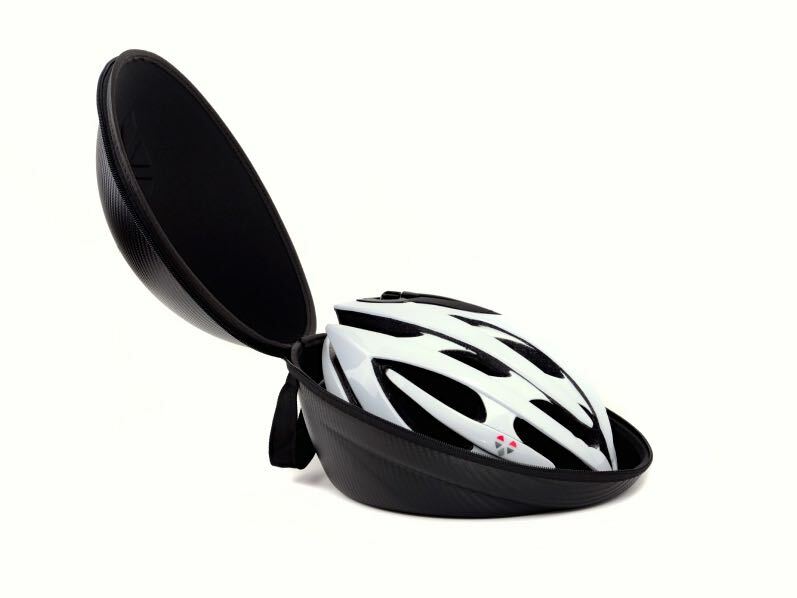 The Lazer Genesis is a comfortable and well-ventilated helmet. The fit is easily adjusted with Lazer’s Rollsys retention system. The optical sensor is unnoticeable. Wearing the LifeBEAM Smart helmet is like wearing any other helmet. The only difference being the added 40g / 1.4oz weight of the electronics. And that it transmits my heart rate to my Edge 705. This helmet does exactly what I had hoped it would. I can track my heart rate data, (essential for generating Strava Suffer Scores), without wearing a chest strap. There is no discernible difference between the heart rates transmitted from the helmet and those from my chest strap mounted heart rate monitor. And “yes” the helmet is more comfortable than the chest strap. The helmet comes with one other useful extra that chest straps do not offer. 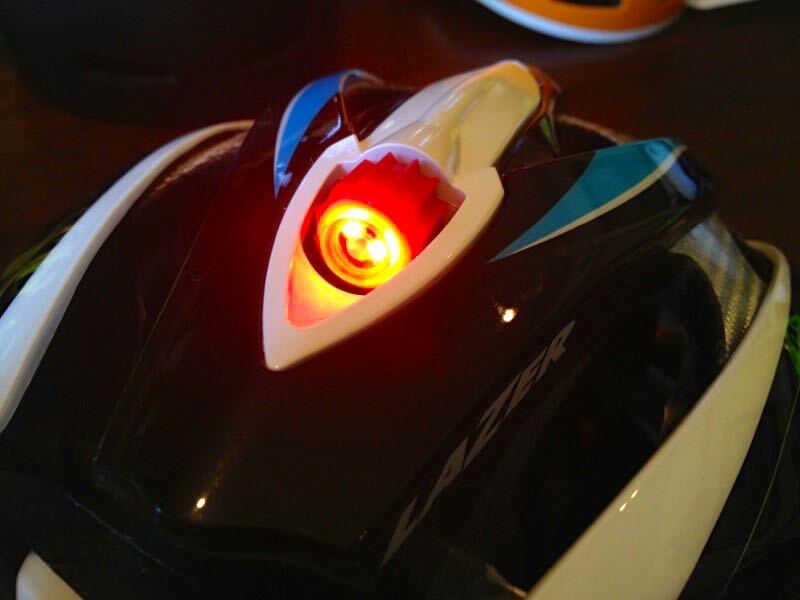 Lazer have developed an LED light that fits inside the Rollsys thumb wheel. You turn the light on and off, and switch between constant and flashing modes, by pushing on the clear lens cover. I unreservedly recommend the LifeBEAM Smart helmet. Both for the excellent integration of optical sensor technology into a cycling helmet, and for the outstanding customer support I received when I had a problem with my helmet. The first helmet I received worked impeccably on rides of less than two hours or so. But on longer rides the helmet would either stop transmitting to my Edge 705, flat line at some arbitrary heart rate, or it would transmit erratic heart rate data. An email to LifeBEAM support produced a quick response. Over the next few weeks a regular exchange ensued as the support team troubleshot the problem. They looked at Strava data files from my longer rides, and conducted some diagnostic tests during a Skype chat session. Despite the best efforts of the support team, the helmet continued to behave erratically on longer rides. The suspect was a faulty optical sensor. So LifeBEAM quickly did what all customers would expect when equipment malfunctions right out of the box. They provided a replacement helmet, free of charge. My replacement helmet arrived two weeks ago. It has performed faultlessly, no matter how long the ride. The optical sensor has been unaffected by rain, and the copious amounts of sweat off my forehead. 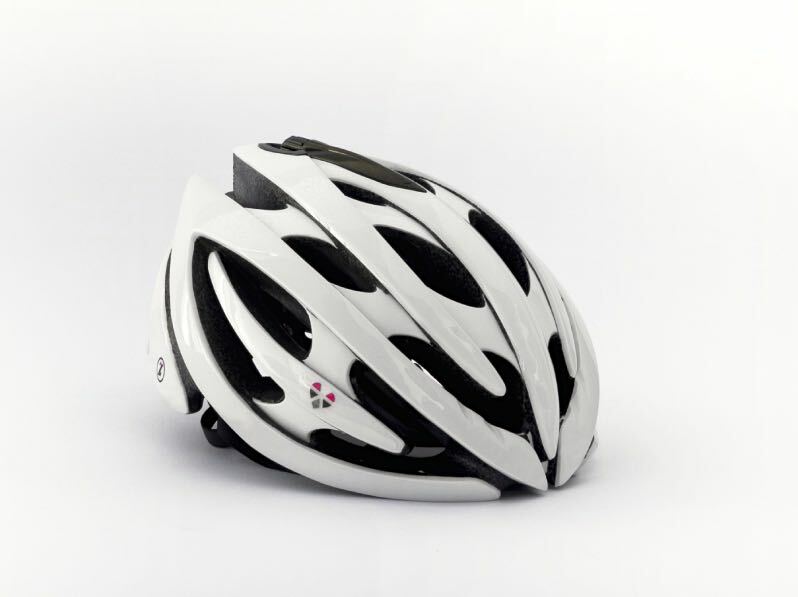 The LifeBeam Smart helmet is a winner. Posted in Gear and Tools and tagged Genesis, Lazer, LifeBeam Smart Helmet, Rollsys, Skype, Strava. Bookmark the permalink.